Today Spick & Span window cleaners went down to Alleyn Park in Dulwich SE21 to clean the windows of a 7 bedroom double-fronted victorian detached property, that has recently undergone extensive renouvation and modernisation. This property on Alleyn Park, which is a road named after Edward Alleyn, lord of the manor of Dulwich from 1606 to 1626, and Founder of nearby Dulwich College in 1619, is very near to many other properties that Spick & Span window cleaners clean in the local area. To ensure that the windows within this property in Dulwich SE21 were cleaned to a professional standard, Spick & Span window cleaners used window cleaning techinques suited to this type of property, Spick & Span window cleaners also placed dust sheets beneath them when they cleaned the windows inside the home this ensured that carpets were protected and remained dry during the whole window cleaning process. The owner of this property in Dulwich, when contacting Spick & Span wasn’t very optomistic that all the windows of this property could be cleaned successfully, as many of the windows were difficult to access. 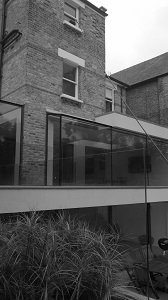 This was because of a very large basement and first floor extension made entirely of glass. Added to the complexities of this window cleaner job in Dulwich was that there were also very large skylights placed on top of the rear extension with difficult to reach windows located above. The familes Au-pair and live-in nanny had also attempted to clean many of the large paned windows herself -without success-including the internal glass sheets, but had only caused smearing, as a result. To clean these windows to perfection Spick & Span used the reach and wash method of window cleaning externally and used other specialised cleaning styles and techniques, such as telescopic window cleaner poles to complete the window cleaning work. When cleaning the windows of this house in Dulwich internally, more traditional methods of window cleaning were used. All windows were cleaned internally and externally, which included 3 Velux windows in the loft in around 6 hours by one window cleaner. After the work was completed the Au-pair was shocked with the difference that the cleaning had made. She commended the window cleaner for the hard work and was confident that Her employer would be more than happy with the results and would be back in touch again soon.